Residents of Munich have a high quality of life and low crime rate when compared to other major German cities like Hamburg and Berlin. The city's name in German is München, referring to the Benedictine monks who founded the city. One of the things in the Frauenkirche that survived the bombing of World War II is the "Devil's Footprint." This is a black mark in a floor tile that is shaped like footprint. It is said to have been made by the Devil when he stamped his foot in anger after the builder of the church tricked him. Munich is the capital of the Bavaria region in Germany. This city has a long history that includes many pivotal and interesting events. Today, the city has many attractions for visitors to see and some top events worth experiencing, like the world-famous Oktoberfest here. Munich’s long history features everything from beer to Mozart. Munich became the capital of Bavaria when it was reunited in 1506. This began a period of flowering in arts, music, and literature with such luminaries as Mozart playing a prominent role. The famous Hofbrauhaus was built in 1589 for the purpose of brewing the city’s trademark brown beer. The Kingdom of Bavaria was established in 1806, and Munich became its capital. It was during the nineteenth century that much of the city’s finest architecture was erected, and Munich began to rival Vienna as a city of beauty and culture. 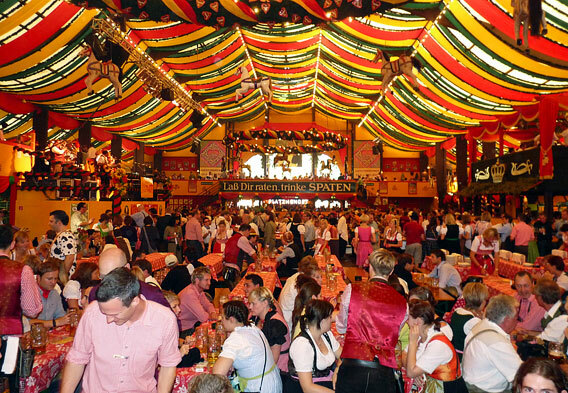 Munich’s Oktoberfest is without a doubt the granddaddy of all beer festivals. It is world famous and one of the top world festivals in any category. It is held in Munich during September and October, attracting more than 5 million attendees each year. It was first held in 1810. Today, the Oktoberfest has become a veritable Bacchanalian feast of food (including Bavarian signature foods like sausages, potato pancakes, pretzels, sauerkraut, and red cabbage) and the consumption of Germany’s favorite beverage—beer. About 20 to 25 large beer tents are set up, and each of these can accommodate hundreds to several thousand revelers. Each beer tent has its own character and type of music. You can listen to everything from rock music to traditional “oomp pah” brass bands. Marienplatz is the center of the city. It is named, not for a person named Marien, but for the Marien column that sits in the center of the large open square. Here you will find both the Old (Alt) and New (Neues) Town Hall (Rathaus), which was built in 1874 and contains 400 rooms. 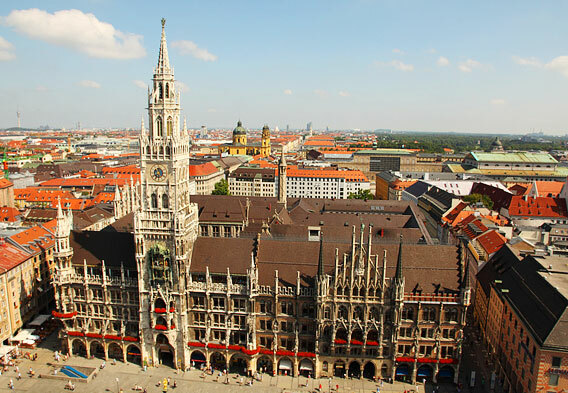 The Neues Rathaus tower boasts a famous and elaborate glockenspiel that performs every day at 11 a.m., noon, and 5 p.m. Like the Changing of the Guards at Buckingham Palace, just about every visitor to the city will make an effort to be in the square at least once to witness the event. Visitors can ride to the top of the tower by elevator. There are still three medieval gates remaining from the walls and fortifications that once surrounded the city. Other buildings and landmarks around the gracious square include the Palace of Justice with its fountain, the Romanesque St. Peter’s Church, the oldest (1158) church in the city, the baroque Church of the Holy Spirit, and the Viktualienmarkt, the most popular market in the city. Frauenkirche, or Church of Our Lady, is also in the city center. It is a beautiful red brick late Gothic cathedral that is, like the New Town Hall, a symbol of Munich. There are regulations in the area around the cathedral that limit the height of buildings. This means the graceful towers are visible from many parts of the city. Visitors are allowed to ascend the south tower, and there are panoramic views of the city and all the way to the Alps. The Hellabrunn Zoo was opened in 1911. Today it is a world-class institution, and the first zoo in the world that did not segregate animals according to their species. Multiple species (more than 17,000 animals in all) live together in habitats that closely resemble their natural habitats. There are large aviaries nearly 60 feet high filled with multiple bird species, an aquarium with beautiful coral reefs and colorful fish, a jungle tent for lions and other species from Africa, an elephant enclosure and orangutan enclosure, and much more. 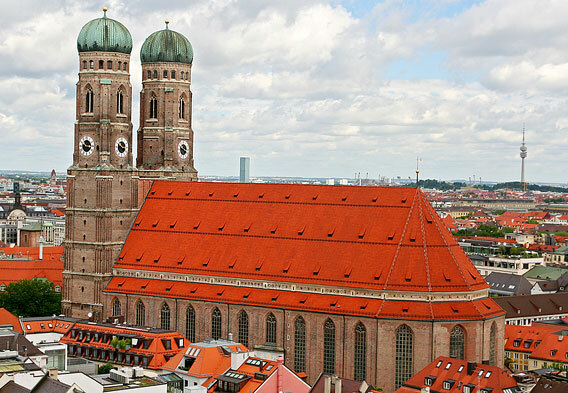 There are a number of lovely churches in the city, including Michaelkirche, which is the largest Renaissance church north of the Alps, and the Italian high baroque basilica Theatinerkirche. There are four grand avenues in the city, reminiscent of the elegant Ringstrasse around the center of Vienna. They are lined with wonderful buildings including the Bavarian State Library, the Maximilianeum home of Parliament, Museum of Ethnology, State Museum of Classical Art, the Haus der Kunst (House of Art), and the Bavarian National Museum.